Under normal circumstances, service as poor as we experienced would have ruined the meal. But gosh darn, the food was so good it overshadowed the bad. Speaking of that reservation, I emailed the restaurant as soon as I confirmed I was going to Montreal. I was happy when I received an email back the next day with a confirmation. I had let the restaurant know that I’ve been eagerly anticipating this meal for years and that I was so excited to finally be going. I made a very specific request to sit at the bar in front of the kitchen. I’d heard these were the best seats in the house. Their reply, “sure that is possible, we’ve made the change to your reservation to reflect that”. We arrived at the busy restaurant and were told by the hostess our seats would be available “in a few minutes”. We decided to stand outside rather than wait in the crowded narrow doorway. A few minutes turned into over 30 minutes, with no acknowledgement from the hostess. I saw others who arrived after us with the same reservation time get seated before us, but remained calm as I knew we had made a special request to sit at the bar. When we were finally called, there was no apology for our wait but I couldn’t believe my shock that we were seated at a table behind the bar. Not AT the bar. The hostess disappeared before we could clarify our request so we took our seats and I tried my best not to let these mis-steps ruin my meal. Our drink order was taken right away and our server came by our table to let us know that he knew we were there, but needed to tend to two other tables before coming to us. Ben and I had a long conversation about how we appreciated that the server would acknowledge us in that way and although he was busy, we were more willing to be patient, just with that simple effort. I say it was a long conversation because we started recounting many of our good vs bad service experiences and got back all the way to our honeymoon over 10 years ago, only to realize our drinks had not arrived yet. When our server did come back to our table, he had a very long list of specials for the evening and although we had already made our choices for dinner, he left us to sit to think about the specials before he’d take our order. I guess I shouldn’t be too hard on him at that point as I think he went to find out where our drinks were. We finally had our drinks and we were able to place our order. It was almost an hour after our reservation time, so I was hungry and getting excited because all of the food being delivered around us looked so delicious. 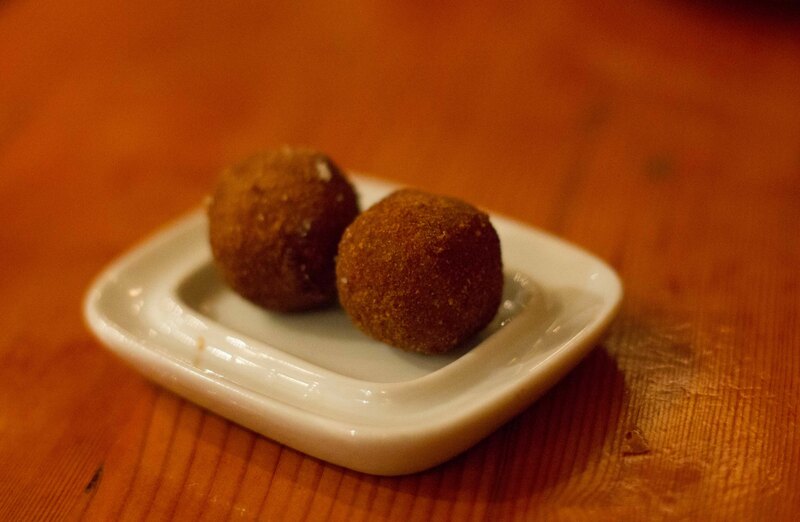 Foie Gras Cromesquis – fried nuggets of molten foie gras. This dish was placed in front of us without warning but I’m glad I had read somewhere that they come out HOT. I’d heard to wait a minute before popping them in your mouth. I waited for over a minute, but still scorched my mouth badly. Had it not been so decadently delicious, I would have spit the thing out because my tongue was burnt. Truth be told, I’m writing this post 2 weeks after this dinner and my tongue is still raw from being burnt. I chose the next 2 dishes because I thought they were on the “lighter” side but happy that they still delivered on the flavour scale. 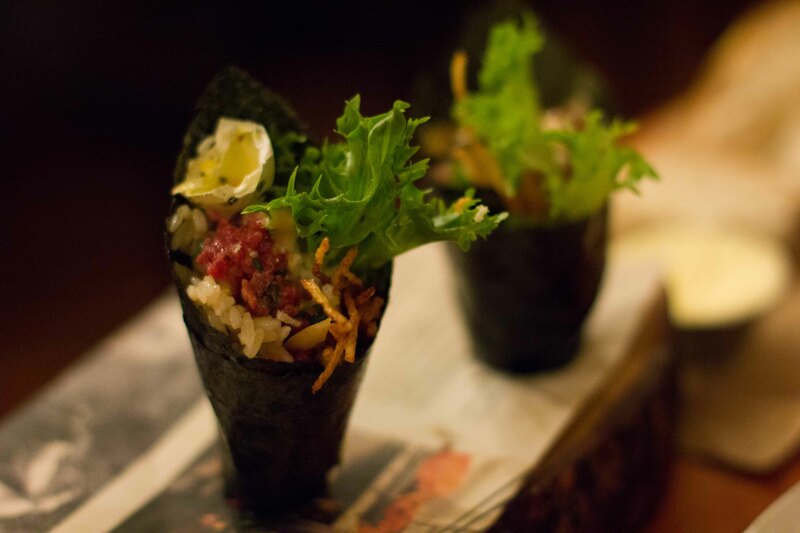 Bison temaki – it looked a bit like a tuna temaki and the bison was similarly tender. The quail egg drizzled on top added a nice succulence and contrast to the crispy rice. 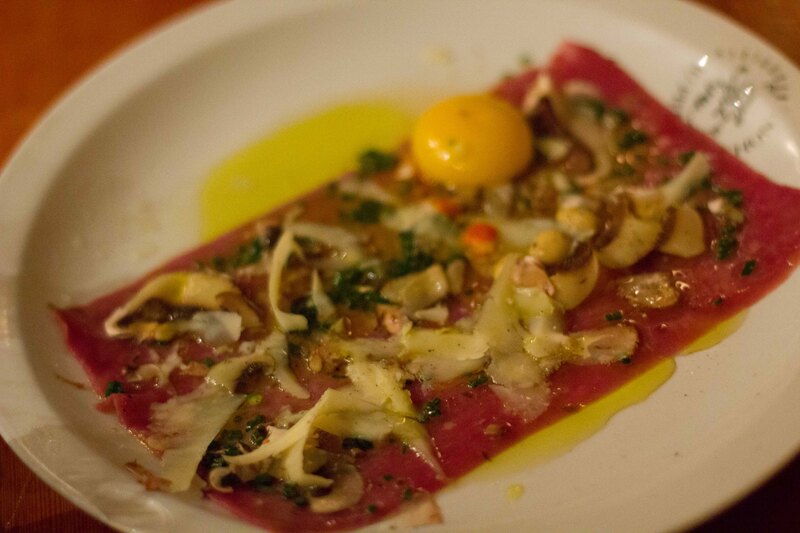 Duck carpaccio – egg yolk to be broken and pulled over top of thin slices of mushrooms and parmesan. 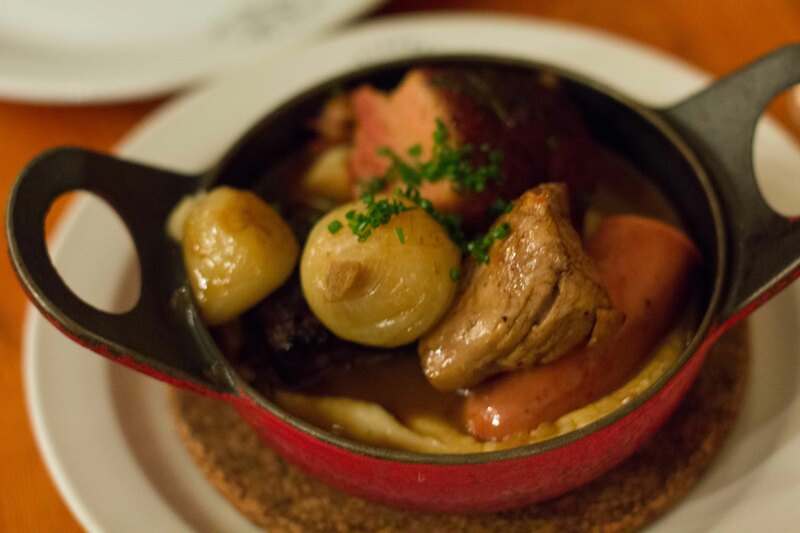 I felt almost shameful that we came to Au Pied de Cochon and ordered such lightweight dishes. I say almost because both raw preparations were amazing and delicious. When the next dish hit the table, I felt like I was joining “the club”. 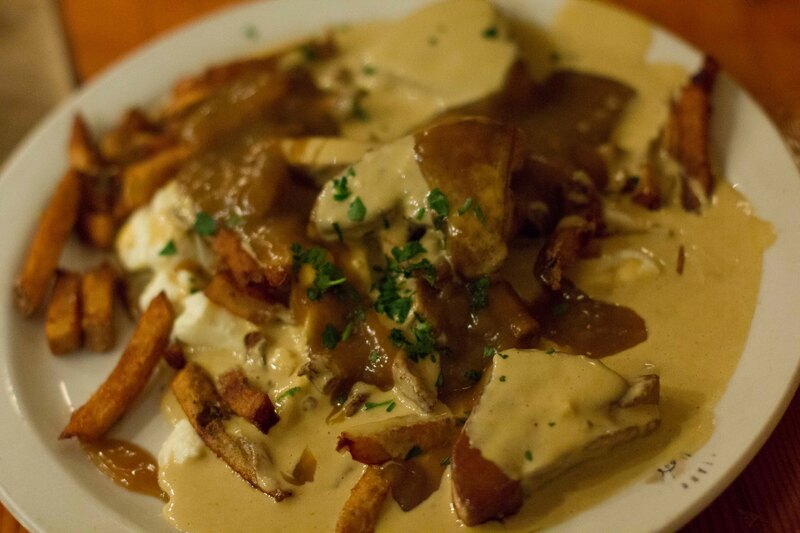 Foie gras poutine – obscenely rich but absolutely delicious. The duck fat fries were perfectly crisp under the foie gras sauce, duck fat gravy, cheese curds and big slabs of foie gras. I’ve never eaten a dish so rich before. I was in fatty heaven but I did look around the restaurant at this point to see if there was an AED on the wall anywhere. I was also happy I wore elastic waistband pants because it wasn’t like we ordered a salad and vegetables to round out this meal. Melting pot – Pork belly, pork loin, boudin noir and sausage sitting on top of a creamy concoction of cheesy mashed potatoes in a pool of pan gravy. All of the bites of plentiful pork products were so wonderful, but even an already bloated belly couldn’t stop me from eating all of the mashed potatoes. Dinner was done and even though I was at maximum capacity, I really wanted to try some desserts. We were able to flag down the server to get a menu and I was able to narrow my choice down to 3 and was going to get a suggestion on the 2 best to order. But again, we ended up waiting over 15 minutes for someone to come back to take our order. By that time my feeling of being full had convinced me that 1 dessert would suffice. After we finished dessert, we waited another 10 minutes for someone to clear our plates and give us the bill. When our server finally showed up with the handheld card reader to our table, I was so aggravated with the lack of service that I wanted to give him a tiny tip. But there’s something very awkward with leaving a small tip to someone, when that someone is standing over you waiting for you to enter your information into the machine. We were given a small opening to offer feedback though when our server asked us (in the moment he was forced to stand beside me while I was using the machine), “how our dinner was”. Where to start? We told him everything I’ve mentioned in this post, to which he said sorry for. But it was “sorry, but we were very busy tonight” – aren’t they busy every night? And they have more than enough staff to compensate for their business. “Sorry your food was so slow in coming out, but we have so many specials, it slows things down” – is that my fault that they put too many complicated specials on their menu? “Sorry no one took the time to explain the food to you, but again, we were very busy” – seriously, it was a Sunday night, yes they were packed, but there were no big groups and a few tables sat empty here and there late in into the evening. Truth be told, at that point in the evening there wasn’t much our server could have said to make up for how weak the service was. 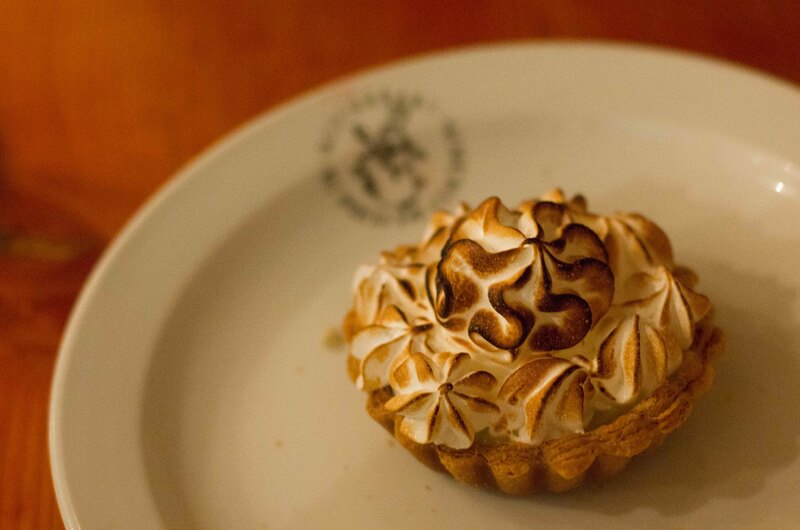 I feel a bit guilty for being critical of Au Pied de Cochon’s service. I don’t like to be negative about my experiences and if you’ve read my posts, you know that I try to be positive about every meal I eat. I was upset after eating at Au Pied de Cochon, but sat on my feelings for a few weeks thinking maybe I could look at the experience more objectively with time. But even looking back now, I realize that the service we had was THAT BAD. I do hope that what we experienced was out of the norm and that if you go, it will be better for you because the food, was THAT GOOD!